Photo: Lars Tufvesson. Nice? Ugly? Comment! Construction/digging started officially February 14, 2001. The construction of the concrete foundation started March 2002. The concrete foundation was ready in August 2002. After that, Turning Torso started to raise above the ground. Kaknästornet, Stockholm, Sweden: 155 meters. Kronprinsen, Malmö, Sweden: 86 meters. Globen, Stockholm, Sweden: 85 meters. Three for those living in the building. Two for those working in the building. Maximum deviation at the top for the most severe expected storm: 0,3 meters. It will not be possible to feel the movement. 25 000 cubic meters of concrete. Every second window can be opened ten centimeters. There are safety blocks. Window cleaning is included in the monthly fee. There will be a special crane on the roof for the purpose. Fire protection: Every room is sprinkled. The water supply for the sprinklers is doubled, and has its own emergency electricity supply. One of the elevators also has emergency electricity supply, for use by the safety personnel during an evacuation. There are 54 floors. The tower turns 90 degrees. The building is modeled after a human torso in a turning motion. Is built by HSB Malmö. HSB started thinking about Turning Torso in May 1999. The total cost is calculated to be around 1600 million SEK. Previously, they were talking about 1100 to 1200 million SEK. In the beginning, they were talking about 950 million SEK. October 2004 (Was August 2004): The concrete framework will be ready. 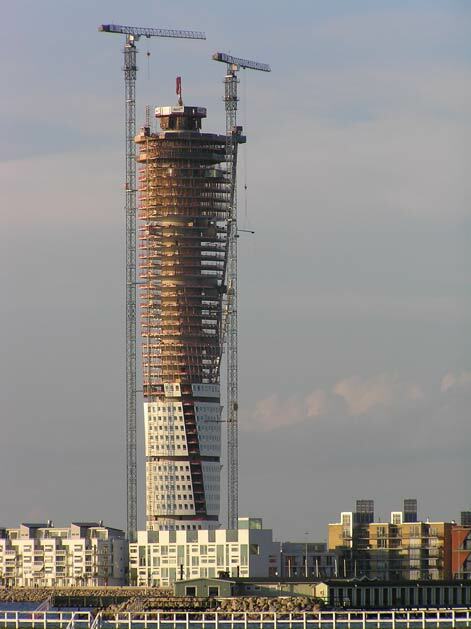 Late Summer 2005 (was Spring 2005): Turning Torso will be ready for its inhabitants. The reinforcing iron bars are made ready on the ground in a building nearby, to minimize crane use. At the top of the building, there is a climbing form used for moulding the core, stair well and elevator shaft. Turning Torso will mainly have rental apartments. The largest apartment will be 230 square meters. The smallest apartment will be 45 square meters. Twelve floors (4 200 square meters.) for commercial use at the bottom. (Offices). All other floors will be used for the 152 apartments. It is not decided yet if the entrance will be manned 24 hours a day. The garage is supervised by a camera. In the original plan, the city wanted a 25-floor student house on the spot. The city wanted a high building there to not let the huge building nearby (Malmömässan) dominate the whole area when seen from far away. For Turning Torso news, check out the Turning Torso news page. For a variety of pictures, check out the Turning Torso photo album. The best Turning Torso pictures can be found on the Turning Torso top ten pictures page. The view from Turning Torso, floor 53. Looking down from Turning Torso. The first piece of the facade arrives from Barcelona. The steel framework around Turning Torso will be ready. Construction ready. Time to move in.